The assumed givens of your thoughts will, at times, get you in trouble with your business colleagues and clients. What you assume is a priority for you in running your business, may not be fully appreciated or shared by say your administrators, agents, or even managers. 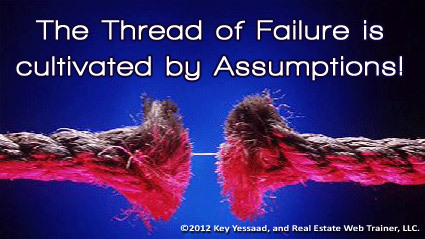 Lots of Brokers and Managers have a loose bond with their business teams and rarely discuss how the business is being run; they get into the mode of assuming how everyone should behave, and end up confronting major breakdowns because assumptions are not reality. Your Business Priorities should not be presumed as understood, they need to be shared, they need to be clear, and they need to be simple; Dee Hock put it this way: ‘Simple, clear purpose and principles give rise to complex and intelligent behavior. Complex rules and regulations give rise to simple and stupid behavior.’ Get to know your ‘givens’ then share them with passion with your team!